The ban lasted until the 1990s when Bill Lark, from Lark Distilleries, based in the capital Hobart, lobbied the Tasmanian state government to amend the Distillation Act of 1901 and allow small distilleries to open. Since then the number of distilleries has eight, soon to be ten. One distillery, The Small Concern Whisky Distillery, sadly couldn’t get backing to secure its future, though its stock is still available to buy. Taste-wise, Tasmanian whisky has been likened to its Scottish forebears, hence the spelling choice of whisky rather than American or Irish whiskey. It is usually made with locally grown malted barley, although rye is also used by some distillers. The Old Hobart Distillery, headed by Casey Overeem, matures their whisky in port and sherry casks, usually in 100 litre barrels. On sale at the moment are five year old whiskies from the first 10 barrels that where filled in 2007. 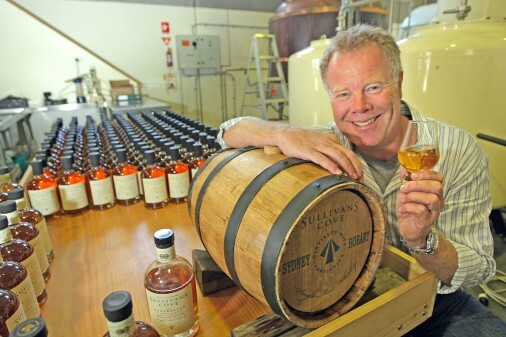 Patrick Maguire, owner and distiller of Sullivan’s Cove Whisky, also based in Hobart, says the flavours come down to the old fashioned way that Tasmanian distillers work – there’s no chill filtering and no caramel used . The two major differences between Scotch whisky and Australian whisky, as identified by Richard Stewart from the Tasmanian Whisky Appreciation Society, is the local Australian barrels most distilleries use for maturation – though Sullivan’s Cove do a double cask whisky which is aged in ex-French oak Port and ex-American oak bourbon casks – and the lack of an equivalent to a heavy Islay whisky. “We’ve got some delicious and smokey whiskies, peated using Tasmanian peat, but that medicinal/iodine flavour that comes from being matured on a windswept, rocky sea shore, well, we may have to wait a bit for that. If I’m recommending it, short and sweet, I ask a person would they like to try one of the best whiskies in the world – and let it go at that.” Says Richard. In some ways Tasmanian whisky flew before it could walk. It took the Australia market a lot longer than the international scene to appreciate just what the distillers down there where doing. Take Sullivan’s Cove Whisky: it was in the international market – in Singapore, France and Holland for seven years and Canada for five – well before the Australians cottoned on. It has recently also broke into the likes of Belgium, Denmark, Sweden, the UK, Dubai and is launching in America soon. Tasmania’s whiskies have been recognised in a flurry of domestic and international awards, and Richard describes their products as now being seen as the whisky to try at many bars around Australia. The Old Hobart Distillery is dominating in most categories, recently taking the title of ‘overall winner’ in the Australian section at a World of Whisky event in Sydney. Internationally it remains small scale compared to what the Scots do – we’re still talking thousands of barrels per year, with the largest storage at Hellyers Road Distillery in Burnie, on the island’s northern coast, is only 3,000 barrels-strong. But its potential to grow is what makes Tasmanian whisky so exciting. Growth may be initially restricted by population and financial resources, but its sheer size suggests the boom may be yet to come – Tasmania’s land mass is just under a third of the land mass of England, Scotland and Wales combined, so its potential is huge. The drive in malt whisky since the 1970s internationally is helping. 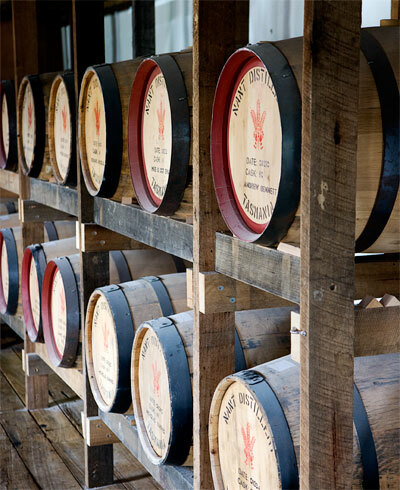 A strong demand, as Bill describes it, for special big whiskies, peated or unpeated, malted barley or rye grain, is reflected by the smaller hand-crafted whisky distilleries from new world areas such as Tasmania. But despite its relatively small size, growth will be restricted by the fact Tasmania neither has the population or resources to compete with the likes of the Scots yet. Expansion is a given but Richard predicts there won’t be huge distilleries the equivalent of Glenfiddich popping up. The argument to keep it small is strong: staying ’boutique’ allows the industry to concentrate on flavour and purity, rather than volume and dollar value. Despite it already being described internationally as “The Whisky Island of Australia”, Bill says he sees the growth being based on a continuance of Tasmanian distilleries producing hand-crafted whiskies. Perhaps the most touching part of this story is the solidarity and support the distillers offer each other. The size of the industry, if not the people, certainly recommends it to taking a united path. 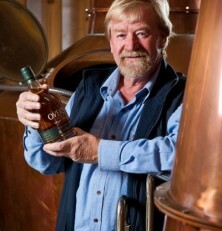 “Tasmanian whisky producers are very proud to sit alongside each other at whisky shows,” says Bill. Grouped together under the Tasmanian Whisky Producers Association, which all Tasmanian distilleries, they want to jointly promote Tasmania as the Whisky Island of Australia. Bill also puts down one of their objectives as establishing the requirements and legislative support for a protected appellation of Tasmanian Whisky in order to protect its high reputation. “None of us are big enough to be competitive and there is a huge market out there so we are better off working together than working apart,” says Patrick.